In three earlier entries (#1, #2 and #3, back in 2011, I was surprised to note) we’ve tried to interpret just one example of single-family domestic life in Agincourt. 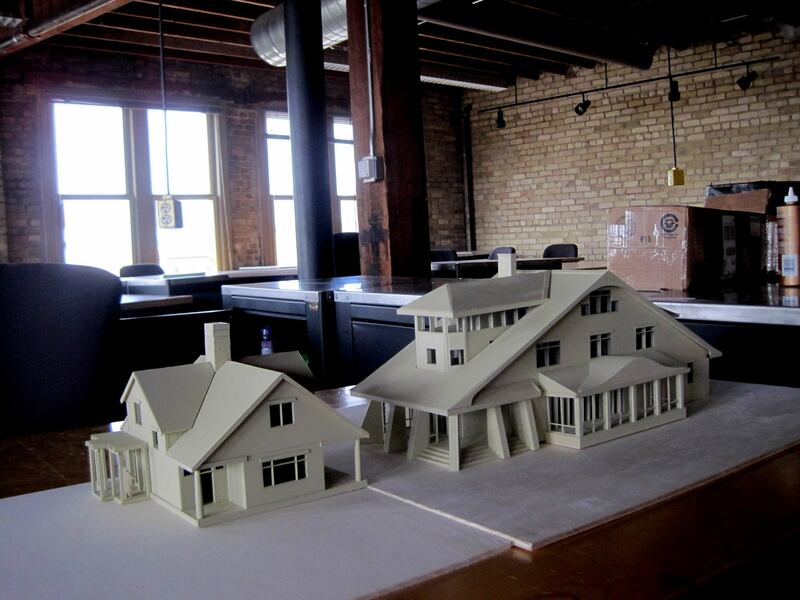 Now that there is a model of the house at 1:48 scale, its story needs more flesh. But history has a way—I should say “has had a way”—of creating long chains of white males as our links with the past. Women, people of color, and other minorities whose citizenship was compromised until recently—and may yet be—have gradually found their way into America’s historical narrative. I’ve actually watched part of that process myself; and it’s been a privilege, by the way. The house at 312 East Agincourt Avenue—I wish it had a name other than its first owner—was built in 1911. [I like to think of those years as “American Edwardian”, but I’m the only one who does.] For fairness, its story ought to be told in at least two parts: the traditional and the other. But I’ll let Howard take over from here. With wealth, power and prestige come responsibilities. Or so the French suggest with their phrase “noblesse oblige”. We’ve had many good examples hereabouts but fewer and fewer with time. Next year will be the centenary of one such case. In 1914 Agincourt businessman and industrialist Aidan Archer established an essay contest for high school students in Fennimore county. The cash prize applied to tuition at an Iowa college or university, and the Class of 2014 will be the hundredth to benefit from Archer’s enlightened view. Archer and his family came to the Muskrat Valley in the spring of 1909 as manager of Ironstone Manufacturing, a company established here by his father-in-law to make enameled cookware. It was one of the first plants in the new Industrial District west of the river. Two years later the Archers built a new home on The Avenue and remained here into the Great Depression. Beyond his role in the business community, or perhaps because of it, Archer was involved in many facets of community life. Members of Asbury Methodist Episcopal, the Archers were “Social Gospel” Christians, subscribers to the notion that we are our brothers’ and sisters’ keepers; that with wealth came responsibility. In that spirit he served on the non-profit Building Association board and was a stockholder in Common Ground, the community’s reward for doughboys returning from the First World War. Politically, he was a Teddy Roosevelt Progressive Republican. Mrs Archer followed suit, serving her church, the public library, and other charitable groups. When they left the community in 1934, a testimonial dinner acknowledged their twenty-five years among us. Happily, the essay prize carries on. The annual challenge, open to any high school senior in Fennimore county, has stayed the same—an essay on the topic “Community and Individual Responsibility”—as relevant today as it was a century ago. It’s curious and more than coincidence that the Class of 2014 will benefit from the Archer bequest—cash given in their lifetimes and a provision in their estate—especially in the light of the sequester and more recent government shutdown. Aidan Archer was a capitalist of a different order and his contributions to the community of a another sort. I’m gratified that a substantial house like the Archers’ might represent something other than conspicuous consumption. But in an earlier blog entry, I hoped it might also interpret other lives: not just Aidan and Cordelia Archer and their children David and Meredith, but perhaps the craftsmen who had built it or the milkman who delivered fresh dairy products twice a week or the live-in domestic who afforded Mrs Archer more time for community service. There’s the “other” history that offers balance. You might know I’m working on the rest of the story now. By agincourtiowa in A few figs from thistles, Uncategorized on Saturday/19/October/2013 .